Congratulations to these DIII teams for clinching their respective districts this past weekend! They will now compete in their respective District Playoff Series May 3-5! Follow all District Playoff info through the link below. Check out the April Scouting Report for all the latest club baseball, softball, basketball, and football news and information! Check out the March Scouting Report to read up on all the latest CollClubSports news and information. This month’s edition includes info on our upcoming playoff events and the latest rankings for each of our leagues! The Official 2019 NCBA Division III World Series Logo has been released! The NCBA is excited to announce that the Holiday Inn Johnstown-Downtwon will serve as the official host hotel for the 2019 NCBA DIII World Series. Check out all the details of the partnership in the official press release. 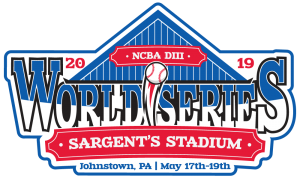 The NCBA is excited to announce that they have reached an agreement with Johnstown, PA and Sargent’s Stadium at the Point to host the 2019 NCBA Division III World Series. Read the official Press Release announcing the agreement here. The final day of previews leaves u with District IV. This district should see a lot of competition as both of the division winners from last year return, Northern Michigan and World Series representative, Missouri S&T, look to hold onto their titles. There are also a couple new faces to the district as Minnesota-Duluth joined the league and DePaul came down from D2. As we head into the spring, Michigan Tech (5-1) leads the North, while Bradley (2-0) and Washington St. Louis (6-0) are tied atop the South. If you want to see more details on these teams and the district be sure to check out the District IV Team Previews. That will do it for the preview of Division III and are excited for baseball to resume this weekend. Check out the February edition of The Scouting Report for all of the latest club basketball, baseball, softball, and football news and information as we gear up for an epic spring! Check out our official press release for details on the 2019 Spring Training Showcase East sponsorship benefits available to participating teams.